The 32-year-old re-trained in beauty and holistic therapy in order to spend more time with her two young children. Mrs Clifton, who is running her busines s from her house and also offers home visits, said: “After having the children I was still travelling a 60 mile round trip for work which no longer fitted in with the needs of the children. “I therefore decided to re-train in beauty and enjoy a change of career and lifestyle. 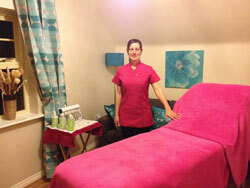 Mrs Clifton offers a range of holistic and beauty treatments including reflexology and ear candling. “People are rushing around with their daily lives doing school runs and have less time than ever before for themselves so I am finding people coming to me as I can offer treatments in the evening and at the weekends. “My children love me being at home more often and being able to pick them up from school. To find out more about Pure Beauty Ltd call (01952) 502187 or 07980 373916 or e-mail Jo@purebeautyltd.co.uk.